Blowout Sale! 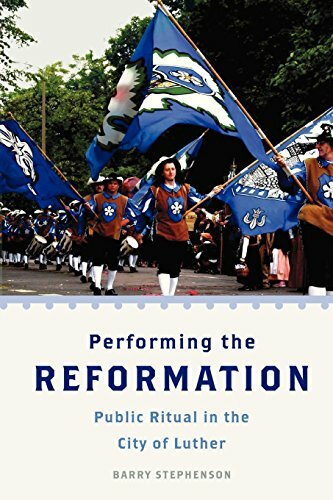 Save 63% on the Performing the Reformation: Public Ritual in the City of Luther (Oxford Ritual Studies) by Oxford University Press at Translate This Website. MPN: illustrations. Hurry! Limited time offer. Offer valid only while supplies last. The home of Martin Luther for thirty six years and seat of the German Reformation, Wittenberg, Germany is now a UNESCO World Heritage site. The home of Martin Luther for thirty six years and seat of the German Reformation, Wittenberg, Germany is now a UNESCO World Heritage site. Wittenberg has long been Protestant sacred space, but since the fall of the Berlin Wall in 1989, the city and surrounding region have been developing their considerable cultural capital. Today, Wittenberg is host to two large-scale annual Luther-themed festivals, and is becoming a center for pilgrimage and heritage tourism. In a recent study, Charles Taylor notes that festivity is experiencing a renaissance as "one of the new forms of religion in our world." Festivals and pilgrimage routes are an integral part of contemporary religion and spirituality, and important cultural institutions in a globalized world. In Performing the Reformation, Stephenson offers a field-based case study of contemporary festivity and pilgrimage in the City of Luther. Welcome to Lutherland, where atheists dress up as monks and nuns for Luther's Wedding; conservative Lutherans work to sacralize the secular, carnival-like festivities; and medieval players, American Gospel singers, and Peruvian pan flute bands compete for the attention of the bustling crowds. Festivals and tourism in Wittenberg include a range of performative genres (parades and processions, liturgies and concerts, music and dance), cut across multiple cultural domains (religion, politics, economics), and effect connections and shifts among identities (religious, secular, American, German, traditional, postmodern). Incorporating visual methodologies and grounded in historical and social contexts, Stephenson provides an on-the-ground account of the annual Luther's Wedding Festival, the Reformation Day Festival, and Lutheran pilgrimage. He also brings his case study into dialogue with important methodological and theoretical issues informing the fields of ritual studies and performance studies.